2018 Marketing Super Stacks – And where you should start when building one? Last week marked another exciting day in the martech world, with the long-awaited release of the Marketing Tech Stack Awards (AKA the “Stackies) at the MarTech Conference in San Jose. The Stackies is an awards programme run as part of the conference, which marketers can use as an opportunity to illustrate their marketing stack conceptually. 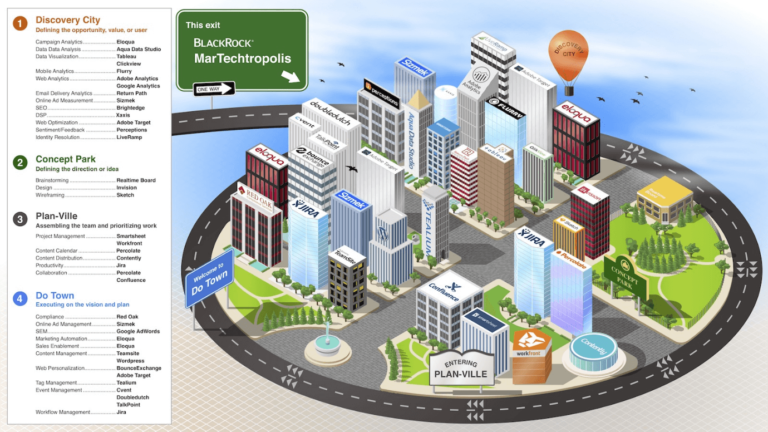 This year saw some remarkable entries from some passionate marketeers, with the top spot taken by BlackRock Marketing Group and its innovative “BlackRock MarTechtropolis” illustration. The purpose of the Stackies is to give insight on real-world examples of marketing stacks used by industry leaders. The illustration puts customers at the core of its marketing efforts, and maps out the seamless consumer journey across all stages of the process through combination of your standard funnel and Sirius Decisions model. We can only speculate on what the 2018 version may look like but given the recent release of the widely anticipated Dynamics 365 for Marketing we expect to this will now be at their core. The powerful new addition to the Dynamics CRM Platform allows for full transparency across the customer journey as well as sales and marketing alignment and enhanced automation features. How should you determine what to focus on in your marketing stack? – The need for a well-rounded marketing technology stack is rooted in the age-old quest for marketers to identify their buyers, what their motivations and pain points are, and how to satisfy them on an ongoing basis. 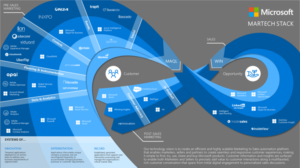 Each solution within a marketing technology stack should set out to serve one of these purposes, and as customers’ expectations increase, so should the intelligence of your martech solutions. With a multitude of categories and over 6,829 vendors, where should you start when building a marketing stack? – With the customer experience playing such a poignant role in the martech stack, it makes sense to focus your efforts on nailing a solid CRM strategy. Doing so effectively will ensure you centralise all your data points to provide a single customer view, ensuring you can provide a rich experience for the customer. You will better understand when is the right time to communicate the right message – ultimately driving your engagement, leads and sales. You’ll gain complete visibility of your sales pipeline to enable better management. Through automated workflows you’ll help optimise operations, but most importantly you will drive sales and marketing alignment. How can we help you? – If you’re looking to nurture customer relations, streamline business processes and, of course, generate more revenue, you’ve come to the right place. We offer flexible Microsoft Dynamics CRM consultancy services tailored specifically to your business goals. Get in touch to find out how we can help revolutionise your business.